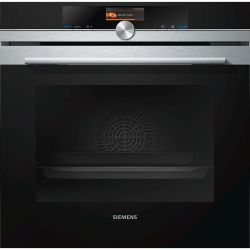 The Siemens HB676GBS6B is a beautifully designed stainless steel single oven with over a dozen functions, all in a 60cm x 60cm package. One of the best of these features is the wonderfully modern HomeConnect, which allows intelligent remote control of your oven via Wi-Fi connected devices. One such possibility is checking on the status of dinner from upstairs, from the car, from the bath, or from pretty much anywhere with an internet connection. If you’re within arms reach of the HB676GBS6B then the full colour TFT touchDisplay provides easy access to all functions in a clear and concise manner. A perfect glossy black glass finish adds to the visual appeal, combine with the timeless aesthetic of stainless steel. You surely won’t be disappointed in this unit’s looks. The wonderful inclusion of softMove technology facilitates the smooth opening and closing of the main door, which will turn make it last longer. Not only this but of course the soft close is a touch of elegance not often seen in ovens. The last cool feature we should mention is coolStart, which negates the need to preheat and specifically aids in cooking from frozen. The idea is that you enter the time advertised on the food item’s packaging, and the oven does all the rest of the work for you.